one of the most enjoyable experiences so far in the US is meeting my twin 6-year-old nephews (sons of a cousin), carlo and franco. 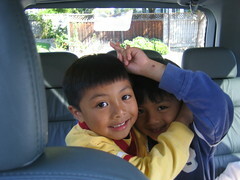 to illustrate how sweet these kids are: immediately after we first met, carlo (or maybe it was franco?) waited patiently outside the bathroom door – while i was using the toilet, mind you – with arms outstretched, holding a plate with a lone corndog on it. the gesture was gross on some level but sweet overall. after that, franco handed me and my sister mini chocolate bars and showed us where their stash was. "this is where the chocolates are but we can't eat them because we're allergic to peanuts." one other thing i learned quickly about these twins is they are quite violent. i don't think they mean to be. maybe it's just too much adrenalin stuffed in small bodies? that first day i met them, i received more punches and kicks than i did in the 3 years i've played with juancho (meek 3-year-old nephew. see past entries.). at one dinner, carlo decided to sit on my lap and use me as his instant exercise machine. he grasped my hands, put each of his legs under mine and swung his so that he was, in effect, kicking my calves with his bare feet to swing my legs. it was almost like a strange marionette show. quite funny, really. that is, up until his left foot slid and his heel landed squarely on my shin. and that's when i screamed. he looked concerned and showed his remorse by offering me the chance to take revenge. "hit MY shin! c'mon! hit my shin!!!" and got on his feet to present his sacrificial shin to me. "i'm not going to hit your shin, carlo," i said. "no, please! hit my shin! HIT MY SHIN!!!" franco, who was within hearing distance all that time, purposefully walked over and gave his twin brother's chin a good whack. and that's when i screamed again. ok, maybe half-screamed, half-laughed. "franco, his shin! not his CHIN!" ah, the magic of brotherly love. "you know, if i wore a hard shoe with a really pointy heel, it would have hurt more." thanks, carlo. i'm counting my blessings.